Foxit Reader is a free PDF document viewer for the Linux platform, with a new streamlined interface, user-customized toolbar, incredibly small size, breezing-fast launch speed and rich features. This empowers PDF document users with Zoom function, Navigation function, Bookmarks, Thumbnails, Text Selection Tool, Snapshot, and Full Screen capabilities. Foxit Reader for Desktop Linux is provided by Foxit Corporation free for non-commercial use. 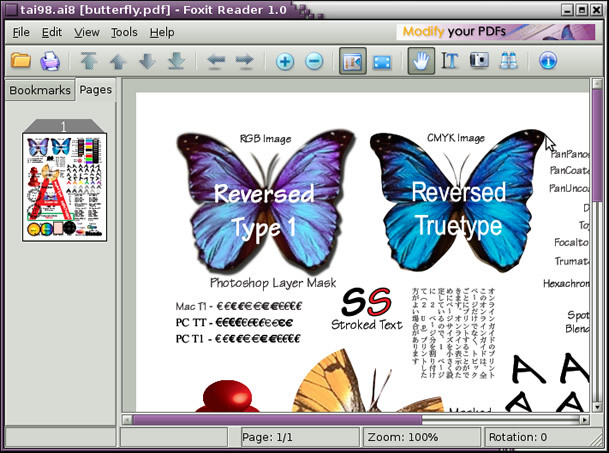 Foxit Reader is a free PDF document viewer with new interface and rich features. Effectively fix the aliasing issue to optimize the display of fonts. The user interface can be displayed in English, Simplified/Traditional Chinese, German and French. It enables users to display the documents with any kind of fonts in your font family selection list. When a document is closed, its current state is stored, such as orientation, current page and position, and scaling. The state will be restored once this file is opened again. Automatically connects to a dictionary program you installed and displays the meaning of the words in a pop-up note box while selecting the word in your document. pdc Form Reader is the program designed to help create the paperless office. It is a free PDF document viewer and printer.Empower PDF document users. Text-to-speech software reading 4 languages: english, german, italian, spanish. A virtual ruler utility/tool for your desktop. PrintDeskTop is freeware that lets you print the exact contents of your screen. PDF Reader is a free program to view, modify and print pdf files. Qweas is providing links to Foxit Reader for Desktop Linux V1.120090810 as a courtesy, and makes no representations regarding Foxit Reader for Desktop Linux or any other applications or any information related thereto. Any questions, complaints or claims regarding this application Foxit Reader for Desktop Linux V1.120090810 must be directed to the appropriate software vendor. You may click the publisher link of Foxit Reader for Desktop Linux on the top of this page to get more details about the vendor.